Introducing al-Jazari's ancestry to modern cybernetics and robotics science, Prof. Toygar Akman narrates in this testimony article his own discovery of the work of the great 13th century Muslim scholar. He shows further how al-Jazari's mechanical achievements laid the ground to a proto science of robotics avant la lettre. First of all, let me explain that I am not an Art Historian; nor am I an archeologist or an examiner of Islamic Art. I am merely an "Examiner of Cybernetics". As you may know, Cybernetics was started after World War II. It is a technical science, which examines the transfer and the balancing of information between machines and people, people and people, and machines and machines. In short it is known as, "control and communication within both animals and machines". Today, the technology of electronics, automated machines, tele-communication, electronic-control and the science of robotics are all products of Cybernetics. As I will explain next, the uncommon genius of al-Jazari has had a profound impact on this science going back to 800 years ago. I have been interested in Cybernetics since 1960, but my most exciting event was the discovery of a very talented Turkish scientist during a trip to Diyarbakir in 1972. 800 years ago this scientist had created simple robots, which could perform several functions. I was thrilled to learn about a Turkish scientist who contributed to Cybernetics. I excitedly imagined the possibilities: attending a conference in a foreign country on "Developments in Cybernetics," or "New Applications in Electronic Technology". If the topic came to the historical evolution of these developments, the participants would be likely to brag about their own scientists. For example, the French could say: "the first scientists of Cybernetics were Descartes and Blaise Pascal, because one of them had introduced the ‘machine-animal model,' and the other had used the binary system in his invention, which is seen as the foundation of today's electronic data transfer." A German could claim the first scientist in Cybernetics as the German philosopher Leibniz because of his ‘automatic wheels,' which could add, subtract, multiply and divide. A Brit could counterclaim that the first scientist to invent a calculator was professor Babbage. As a Turk, I would need to remain quiet. Maybe some would be thinking, "Science has no country. It is for the good of everyone". They may be correct. Nevertheless, there is something, which should never be forgotten. When a famous scientist dies, his coffin is wrapped in his national flag. As the citizens march behind the coffin respectfully, with mixed emotions of pride and sorrow, they think: "this great scientist is one of ours". This was the kind of excitement I felt during my trip to Diyarbakir in 1972 . It was a particularly cold winter week in Diyarbakir, when I was visiting this old city. The fog had grounded all the planes. The trains were not working on the frozen railroads. The weather conditions did not allow for people to go outside much at all. The only productive work I could do under these circumstances was to study the interesting structures in the city and do research in the library. My time at the library introduced me to a publication called Black-Amid (Amid was Diyarbakir's old name.) I started looking through the 2nd issue in volume 2 and I noticed an article by Ibrahim Hakki Konyali titled "Turkish palaces used machines eight centuries ago." As I read through the pages, I learned about the scientist named Abu 'l-'Izz al-Jazari, who served his masters through "automatic machines" and "various robotics." The same article also stated that the original book written by al-Jazari was kept at Istanbul's Topkapi Palace, at Ahmed III's Library, and that another hand-written copy was at the library at Aya Sophia, which had 66 pages stolen . Upon return to Istanbul from Diyarbakir, I immediately went to Ahmed III's Library at Topkapi Palace. I found the book registered under number 3472. Since the ‘language of science' used in Artuk Turks' palace in the 13th century was Arabic, the book was also written in Arabic. (This was similar to how the ‘language of science' used by the Selcuk Turks in Konya was Persian and it was Latin in the Western cultures.) The title of the book read in Arabic Kitab al-Jami' bayn al-'ilm wa-'l-'amal an-nafi' fi sina'a al-hiyal. This could be translated as "The Book of the Science and the Art of the Making Automated Tools" . Figure 1: The cover of the magazine "Science and Technics" (Bilim ve Teknik) published by TUBITAK. I felt a deep feeling of pride as I turned the pages of this 800-year old book, which had established the basic principles of Cybernetics around "adjustment systems around stability". My book on Cybernetics, Evolution in Science was in print at the time. I decided to stop the print so that I could add a few paragraphs about the very interesting work by Abu 'l-'Izz and my efforts to get his book translated as soon as possible. My book got published later in 1972 and I had the pleasure of being the first person to introduce al-Jazari to our nation . While I continued to plead with my friends in the academic field to get this book translated, I also explained my finding to the authorities at TUBITAK and suggested that one of the automatic machines be built as a statue. My article on this subject was first published in the Science and Techniques Magazine (April 1974, issue no. 77), and the picture of an automated machine used for Muslims to wash up before prayers was used on the magazine's cover . In this automated system the whole artuc assembly is placed in front of the king. Water is poured into the castle. This continues in an automatic system until the water in the castle is almost exhausted, whereupon the duck drinks all the water that is in the basin. Upon this the robot holds out his left hand with the towel and comb, Artuc Kings dries then themselves and use the comb then put them back into his hand. 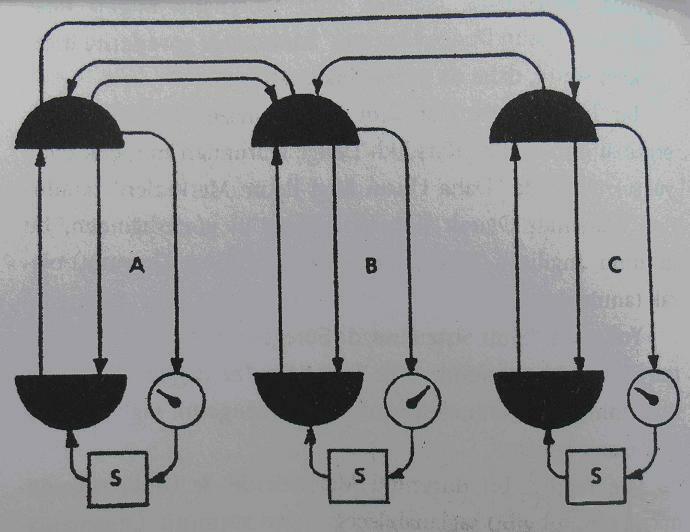 Figure 2: This illustration is explained in detail in Donald Hill's translation of al-Jazari's book, The Book of Knowledge of Ingenious Mechanical Devices (Reidel, 1974), pp. 107-109 (the fig. is on p. 107). Later on in the same year, I proudly attended the meeting on "Electro-Technological Developments" in Brussels, and presented my findings. Right before I went to Brussels, Donald R. Hill from UK had printed his book in Dordrecht, Holland titled The Book of Knowledge of Ingenious Mechanical Devices. His book introduced the works of al-Jazari in English to a much wider audience. Furthermore, because Donald R. Hill was an engineer as well as an art historian, he was able to explain al-Jazari's works of automatic systems through drawings. I thank Mr. Hill for giving us the opportunity to look at al-Jazari's systems through the perspective of cybernetics. A year later, in 1975, my book titled Automation System and Data Banks included works of al-Jazari: "the pictures of automated tools and automated robots as well as their explanations" . In 1976, my second article explaining the systems set up by al-Jazari was published in the Science and Techniques Magazine (103rd issue), which also displayed the ‘Automated Bird Clock' on its cover . Figure 3: Automatic Horseman and Musicians Tool, a leaf detached from al-Jazari's treatise displayed in the Metropolitan Museum in New York, Islamic Arts section. In the following years, the excitement of al-Jazari spread all around the country. TUBITAK asked that I speak to a group of award winning students on November 24, 1976 on our now famous scientist and his works. My speech got published in the magazine's 113th issue in full . Many years later, I was visiting the Metropolitan Museum in New York. In the Islamic Arts section, I was saddened to see two pages from al-Jazari's hand-written book on display complete with colorful pictures. One page was showing the "Automatic Tool with Elephant and Bird." The other was showing the "Automatic Horseman and Musicians Tool." I wondered why the display only showed pages from a book instead of the entire book. I could not help but be suspicious of whether or not these were from the stolen pages, which I had read about in Ibrahim Hakki Konyali's article in Black-Ami in Diyarbakir in 1972. I thought the caption under the pages on display was also rather interesting as it explained the visuals as the works of "Al Jazari, Muslim Engineer, who lived during the 13th century Egyptian Memluk Sultanate". Figure 4: Drawing from W. Ross Ashby, Design for a Brain: The Origin of Adaptive Behavior, Chapman & Hall, 1952; reedited Wiley, 2nd edition, 1960, see related section on pp. 205-214. I cannot do justice to explaining the importance of al-Jazari, without talking about the thinking of contemporary scientist of Cybernetics, Ross Ashby. Professor Ashby is a medical doctor. He observed that within a human organism, the balancing process between different organs was controlled by a more sophisticated data processing center. He called this "ultrastability". In his book titled Design For A Brain, Ashby explains his theory through a drawing. The areas (A) and (B), and (B) and (C) are directly linked to one another. Ashby indicates that even though (A) and (C) do not have such a direct relation, they are connected through (B), which serves as an intermediary. This is not a continuous, but an extremely sophisticated intermittent system, but one that establishes "ultrastability." The ultrastability system is applicated in the high technology robotics today. Figure 5: Original illustration of the boat robot, taken from al-Jazari's book al-Jami' (Topkapi Palace, Ahmet III Library, MS. 3472). If we compare Professor Ashby's explanations to the process followed in one of al-Jazari's inventions, namely, "the automated musicians in the automatically moving boat", then we can see that our scientist from Cizre had also achieved "ultrastability" in his work. The musicians on the boat start playing their instruments once the water flows from a tank in the boat, which subsequently initiates movement for the dancers. The flow of water also sets the oarsman in motion, whose rowing moves the boat forward. This shows that al-Jazari had clearly established a process of movement and balance between multiple systems. It is noteworthy to explain that if Eb-Ul-Iz had a slightly different design, and instead of the oarsman, he had used wheels connected to a propeller in the back of the boat set into motion by the running water, then he could have been the first scientist to move an object through the use of a propeller. Figure 6: The Elephant Clock: Leaf from al-Jazari's treatise, detached folio from an illustrated manuscript dated 715 H/1315 CE (Ink, colors, and gold on paper; H. 11 13/16 in. (30 cm), W. 7 3/4 in. (19.7 cm). Displayed in the Metropolitan Museum in New York, Islamic Arts section. Another great piece of work by this scientist is seen in his "Automatic Elephant Clock." There are several actions set in motion every hour. As the water builds up in a tank, it eventually reaches a level, which sets off a ball dropped from a hawk's beak into the mouth of a snake, and the rider sitting on top strikes the elephant as a result. The water tank starts to fill up again and the series of actions are repeated in the following hour. A similar mechanical process is displayed in his "Entertainment Center," which serves drinks, again through the use of a series of motions set by flowing water. As displayed in all these devices, al-Jazari used only the force of water and the power of air pressure to build his systems 800 years ago. His works could be seen as the path to today's robotics, even though they were built in an era with absolutely no knowledge of electrons, photons and positrons each containing data units and electro magnetic fields. These are all examples of "control and communication systems" in today's cybernetics and technology of robotics. We cannot help but conclude that al-Jazari's thinking had planted the seeds to today's science of robotics 800 years ago! Akman, Toygar, "First Turkish Cybernetician: Eb-Ül-Iz" (In Turkish: Ilk Türk Sibernetik Bilgini Eb-Ül-Iz), Bilim ve teknik, 1976, N° 103. [Debate], A Muslim was the father of robotics? What do you think? Nadarajan, Gunalan, Islamic Automation: A Reading of al-Jazari's The Book of Knowledge of Ingenious Mechanicl Devices (1206). Ören, Tuncer, "Advances in Computer and Information Sciences: From Abacus to Holonic Agents." Turkish Journal of Electrical Engineering and Computer Sciences (Special Issue on Artificial Intelligence of Elektrik), published by TUBITAK (The Turkish Science and Technical Council), vol. 9:1, 2001: pp. 63-70. [Programmable Robot], A 13th Century Programmable Robot. University of Sheffield (2007). Retrieved on 20.02.2008. Sánchez Martín FM, et al., "Historia de la robótica: de Arquitas de Tarento al robot Da Vinci (Parte I)", Actas Urologicas Espanoles, vol. 31(2), 2007: pp. 69-76. Sharkey, Noel, "The programmable robot of ancient Greece, NewScientist.com news service, 04 July 2007. [Timeline] : Timeline of Robotics. Proceedings of the 4th Serbian-Hungarian Joint Symposium on Intelligent Systems, SYSY 2006, Subotica, Serbia. Toygar Akman, Cybernetics Creation, Ankara, 1984, p. 35. Konyali Ibrahim Hakki, "Turkish Palaces Used Machines Eight Centuries Ago", Black Amid Magazine, 1969, Issue 5, pp. 2-7. The exact translation is A Compendium on the Theory and Useful Practice of the Mechanical Arts or literally: A Compendium on the science and useful practice of the making of machines (the editor). Toygar Akman, Cybernetics: An Evolution in Science Computers and Reform in Law, Banka Ve Tic. Hu. Aras. Enstitusu, Ankara, 1972, pp. 11-15. Toygar Akman, "Eb-ul-Iz: The Turkish Scientist who Built Automated Machines Eight Hundred Years Ago", Bilim ve Teknik, Issue 77, pp. 1-6. Toygar Akman,Automation System and Data Banks. Banka ve Tic. Huk. Arastirma Ens., Ankara, 1975, pp. 153-158. Toygar Akman, "The First Turkish Scientist in Cybertenics: Eb-Ul-Iz", Bilim ve Teknil, Issue 103, pp.1-4. Toygar Akman, "Man Future Scientists and Eb-Ul-Iz", Bilim ve Teknik, Issue 113, pp. 7-10. * PhD, Emeritus Senior Researcher of TUBITAK (The Turkish Science and Technical Council).